A new twist on our original product! Ionic Flux has new upgraded bottle with precision dropper nozzle. 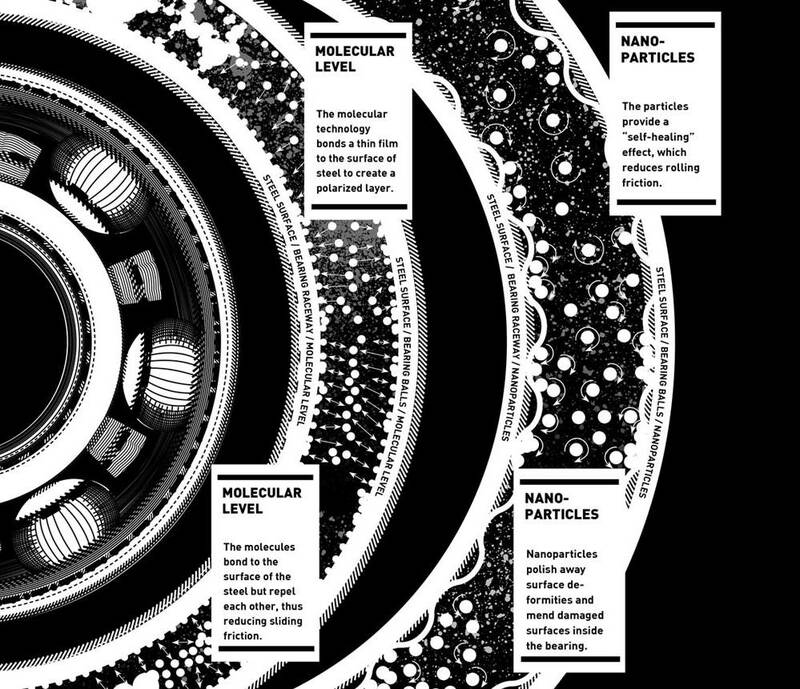 Black Steel reduces friction in steel bearings by forming a thin molecular film on the surface of internal moving parts, which repel each other as a result of polarized molecules, ensuring non­contact between metallic moving parts. Nano­particles in this lube give a restorative effect by polishing away internal steel surface deformities, ensuring the extended performance and life of your bearings. This low viscosity oil is combined with additives that purge dirt, moisture, and contains corrosion inhibitors to battle all the asphalt and weather elements your bearings encounter. The long awaited bearing oil specially formulated for Ceramic Hybrid Bearings. Black Ceramic is a specially formulated oil with ultra low viscosity, designed for competitive skaters using hybrid ceramic bearings. As a result of polarized molecules that bond to steel, this oil forms a protective friction-reducing tribolayer on the internal steel raceways of your ceramic bearings. The result is maximized performance, improved oil adhesion, and protection against wear and corrosion. Coupled with Ionic Flux’s nano-technology additives, this oil polishes internal raceways and mends micro-cracks to reduce rolling resistance and extend bearing life. Also known as the “God-speed” formula among the Downhill Skateboarding Community. GS formula is an ultra low viscosity lubricant exclusively for race application. This oil incorporates military grade nano-additives that take immediate effect and provide optimum performance on demand. Combined with polarized molecules that bond to steel, and 2 specific nanomaterials, it first forms a friction reducing tribolayer on all internal raceways to protect and reduce sliding friction, instantly fills in nano-fissures of surfaces to smoothen, and incorporates micron-scale nano-materials that reduce all forms of rolling resistance continuously. Intended specifically for application before each race, it will enable absolute peak performance possible from your bearings to give the leading edge in competition.